It’s a pity Gingrich was not around when the Roman Emperor Gaius Julius Caesar Augustus Germanicus, better known by his nickname Caligula, reputedly named Incitatus as a consul and a priest. 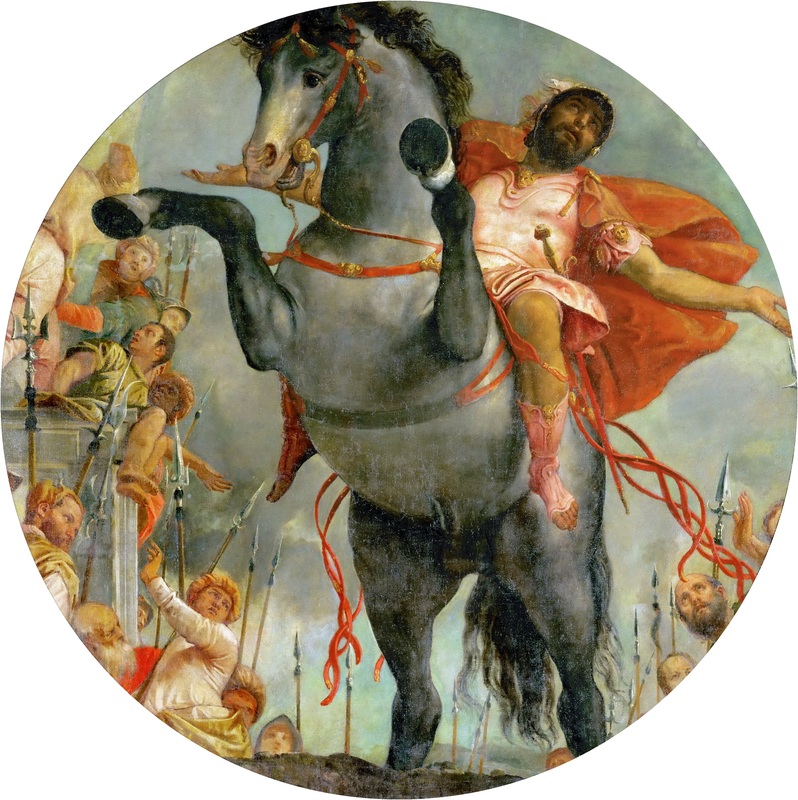 Incitatus was his horse. I’ll have more to say about Palin’s science gap later today, so for now, consider this a bit of entertainment to have with your mid-afternoon coffee and cookies. February 12 is an auspicious day, at least by my lights — birthday to two of my heroes, Abraham Lincoln and Charles Darwin. 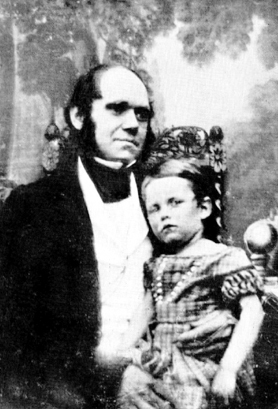 Much of Darwin’s writing is available online. My favorite way to pass (waste?) a little time is to look through the enormous correspondence now up at the site — 5000 letters, up to about 1868. In honor of the great man’s birthday, (199 — next up is the big year), I looked for what something that might give us a clue as to what he was thinking about 150 years ago today. There’s no letter from the 12th, but on February 11, 1858, Charles did write to his son, William. It’s a nice little note, ordinary family news — mixed in with just a hint of what made Darwin, Darwin. The older Darwin tells his son of some minor matters of family business: their gray mare has turned out to be too skittish — nearly overturning the cart a few days earlier — so off she must go for 25 quid to the local horse dealer. Darwin grumbles a bit — “indeed it is very inconvenient for us being with only one horse,” but tells William that he will not replace the ill-favored mare until the summer holidays. As Norfolk is near Suffolk, look out for me, whether there are near you any Suffolk Punches or large Cart-Horses of a Chesnut colour; if so please observe whether they have a dark stripe or band down the spine to root of tail; also for mere chance, whether any trace of a cross stripe on the shoulder, where the Donkey has, & any cross-stripes on the legs. Darwin, of course, had already written about the significance of stripes and other markings on horses. He had already written a brief essay on the significance of the striped markings of horses and their relatives the year before as part of what would become the “Laws of Variation” chapter of The Origin of Species (pp 127-131 in this online version of the 6th edition). The Origin would not be published until 1859, though, (making next year both Darwin’s bicentennial and the 150th anniversary of the publication of the most important book since Newton’s Principia). In other words: if you read the Origin, and even more if you dive into the long slog that is The Descent of Man you quickly come under the spell of Darwin’s gentle but relentless accumulation of facts, organized around one never-wavering thread of argument. Darwin did not triumph by direct, exuberant attack — that was Huxley’s job, ably taken up these days by all the usual suspects. Instead, he lulled friend and foe alike with observation after observation, striped horse after barred donkey. You come out the other side enmeshed — not in the grandeur of this view of the world — but in its accuracy, the coherence in which Darwin has organized all his disparate knowledge into a single convincing whole. There it is: Charles at home. How did Darwin do his great work? This is how: through his own observations; through years of thought; and through the community of affection and interest he created around him — the family, friends and strangers who supplied him with the knowledge he could not discover himself. At the heart of the whole enterprise: the fact that Darwin always, in any circumstance, even in a casual note to his son, found his way to one more fact. 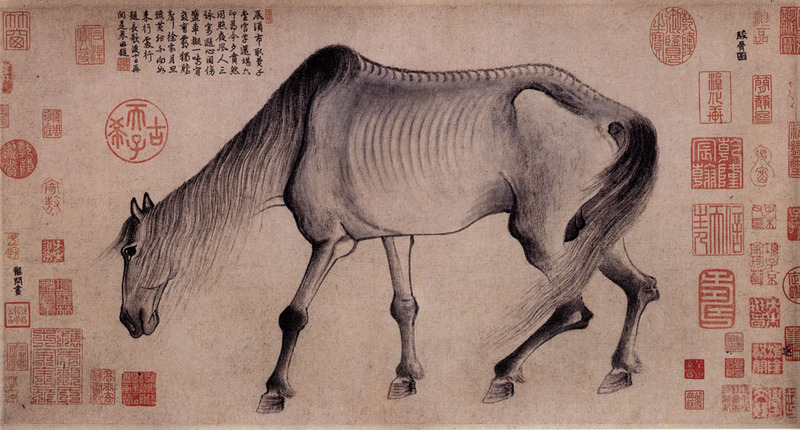 Gong Kai, “Emaciated Horse” after 1279. Location: Osaka Municipal Museum. Source for both images: Wikimedia Commons.